Netanyahu Given More Power to Declare War | Have Ye Not Read? 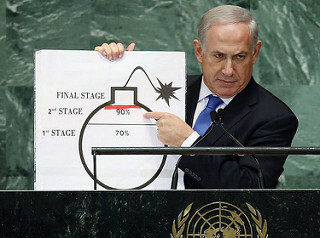 According to this news article, just days after Israeli Prime Minister Benjamin Netanyahu conducted a globally televised news conference documenting evidence that Iran has not been compliant with their nuclear deal, the Israeli Knesset has given Netanyahu sweeping new powers to declare war in extreme situations with only the Defense Minister’s approval. In other words, as long as the Israeli Defense Minister approves, and the situation is deemed to be “extreme,” Netanyahu can now declare war against Iran (or any other country labeled a threat). Point being, Israel is indeed getting ready to go to war. We don’t know if it’s sooner, or later. But it’s certainly coming. Why is this war important? Because it has the potential to fulfill the ancient prophesy written of in Daniel chapter 8, in which Iran (represented in the Scripture as a “ram”) is attacked and completely conquered by a “he goat” (described in Scripture as being “moved with choler against the ram”). There’s much more in those verses in Daniel chapter 8. Those are just the pertinent highlights. So if you haven’t done so already, you can learn more about them in my study, The 4 Winds and the Deadly Wound. Until then, keep your eyes on Jerusalem. That’s where all of the action will be from this point forward. Sign up here to receive notifications of Steve’s News & Current Events Commentaries, as well as notifications when new in-depth Bible studies are posted. You’ll also receive a free copy of Steve’ in-depth Bible study, The Four Parts of God’s Plan, when you sign up. Video: Why is the Trump Administration Launching an Effort to Legalize Homosexuality Worldwide? Can You Live Forever Without God? Russia Captures Three Ukrainian Ships; Signpost of Daniel 7:5? Does a Red Heifer Being Born in Israel Signal the End of Days? Why Are Russia and Eastern Europe Now More Christian than the West? Freedom and Patriotism: What Is It, Really? Was It Right for Trump to Wish Muslims ‘The Blessings of Ramadan’ at White House Iftar Dinner? Bilderberg 2018: Prelude to War with Iran, Or Not? What Went Wrong With Western Christianity? Jerusalem as the Coming Religious Capital of the World? Would You Like to Attend a “Beyonce Mass”? Is Israel Going to War With Iran? Kids Now Becoming Do-It-Yourself Transgenders; Who’s At Fault? Is Christianity Under Attack in the U.S.? End of the World “Rapture” April 23? What Will Happen When Islam Takes Over Britain? Should Christians Bother to Vote When Both Sides Are Controlled by the Enemy?